This beautiful new white cotton blend bonnet is made by Will'beth, a leading designer of beautifully detailed baby clothing. It features a wide smocked band detailed with embroidered flowers accented with tiny seed pearls. The face ruffle is finished with scalloped embroidery. 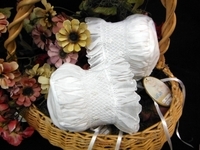 The bonnet ties under the chin with long white satin ribbons. 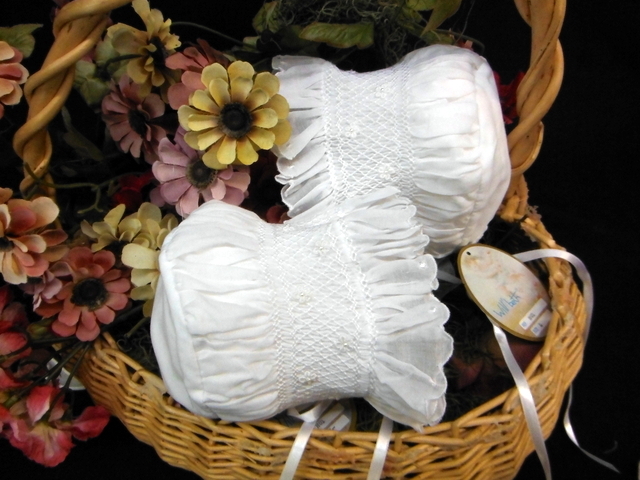 Perfect for a christening bonnet or any special occasion! Coordinates with any of the Will'beth dresses.